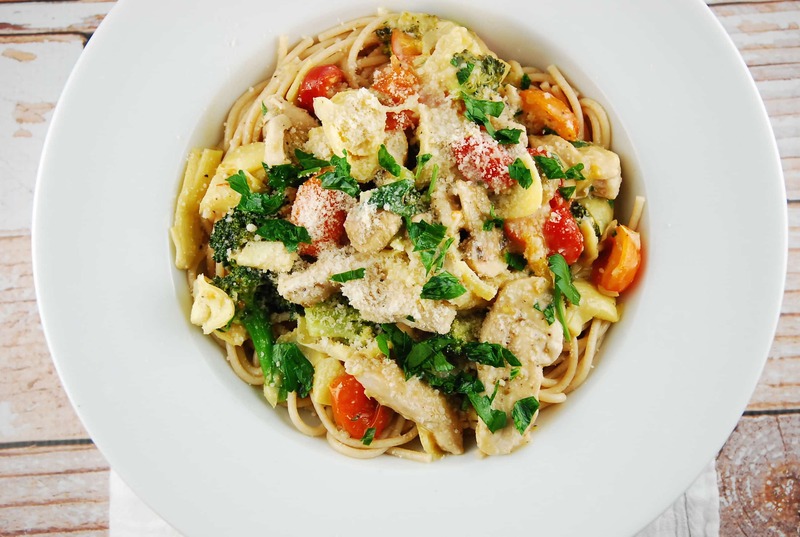 When I want a simple Weight Watchers pasta recipe that packs in a lot of protein and fiber, I turn to this Artichoke Chicken Pasta Recipe, which is one of my go to dinners. It’s very easy to make, doesn’t take a lot of time, looks absolutely lovely, and tastes delicious. Plus, each 1 cup serving is just 6 Points. I’ve gotten a few emails from previous pasta recipes I’ve posted, mentioning that the actual amount of pasta in the recipes was too small for their family. In order to keep the Points values low, I try to really keep those carbs in check. So, I prefer to take it easy on the carb laden pasta noodles, and bulk up with the veggies and protein. However, if you prefer a larger portion, you can make this a 4 serving meal instead of six. It will come out to a Points value of 9 Points per serving. Balance that out with a light salad, and it’s still not a bad deal! The delicate wine sauce is fantastic, but if you prefer to not use wine, you can use fat free chicken broth, with a squeeze of fresh lemon juice instead. Beautiful, delicious and healthy, this Weight Watchers pasta dish is great for casual weeknights, and impressive enough for dinner guests. The simple wine sauce allows for the natural flavors of the vegetables to really shine. Cook pasta noodles according to package directions. Drain and set aside. While pasta is cooking, heat 1 tsp olive oil in a large nonstick skillet. Season chicken pieces with salt, pepper, basil and oregano, and sauté chicken until cooked through, about 6 minutes. Remove from pan and set aside. Add remaining oil to skillet, and then toss in the broccoli and garlic. Cook for about 2 -3 minutes. Now add in tomatoes, mushrooms and artichokes, and cook until all vegetables are mostly tender, about 3 minutes. In a small bowl, whisk together the flour and wine. Stir into the skillet with the vegetables. Bring to a simmer and cook until sauce is thickened, about 3-4 minutes. Season with salt and pepper as desired. Add in reserved chicken. Divide the pasta into serving bowls and top evenly with the chicken and vegetables. Sprinkle with the parmesan and fresh parsley, and serve. Thank you for the recipe, my husband and I both loved this!!! One thing we were not sure on though is if it is 1 cup all mixed together or 1 cup of pasta and then 1 cup of veggies. We weren’t to sure how to measure it all out. The flour and wine sauce was not quite right. It was too thick and the plain white wine/ flour sauce was bland .This recipe was lacking the usual Laaloosh Luciousness!!! Please let me know how I can safe your recipes, as Ziplist no longer exists. Today’s recipe for Artichoke Chicken Pasta Salad is confusing ~ the introductory para says 1 cup serving is 6+ points but the nutritional value at the end of the recipe says 1-1/2 cups is 1 serving at 6+ points. Which is it? It is 1 cup…..I’ve corrected the typo….thanks for catching that! In the description, you said that 1 cup is 6 points, but in the recipe it says 1 1/2 cups is 6 points. I just wanted to confirm which was correct. Thanks! My bad…the correct serving size is 1 cup. I’ve updated the recipe to reflect the correct amount.